Narrowing down the best broadheads on the market to a short list of premium options is a daunting task but we have done that work for you. If what you seek is a proven solution to take down your chosen quarry, read on intrepid hunters. No matter what game you are after, we have the solution! Sometimes you go with the tried and true but sometimes you just need to break out of the mold and shoot a bunch of different options just to see what’s on the market these days. I mean, if you are looking for the best broadheads, innovation is going to be a factor. There are choices out today that are nothing like what the sport had just 10 years ago. For those who have bow hunted even a little it may be obvious but for the newcomer, let give a little introduction. If you shoot a field point arrow that is the same size as the shaft, the arrow will block the blood flow. You may take out smaller animals this way by hitting a vital area but larger animals need to bleed out from an arrow strike. Broadheads are simply a head with blades larger than the shaft the arrow in at least one dimension. The cutting forms a wound channel that allows blood to flow out past the arrow. This seems barbaric to some but with enough blood loss, the animal will not have long to suffer before it falls unconscious and succumbs to the wound. Often broadheads have an intimidating look. Part of that is styling to sell the broadhead but it also serves the purpose of opening a wound capable of a humane kill. For all but the smallest game, broadheads are necessary both in terms of effectiveness but also legality. Common animals hunted with broadheads are most varieties of deer, elk, bear, wild or feral hog, turkey, and some smaller game animals like coyote or rabbit. In general, traditional wood bows will do better with lighter broadheads. The same is true of the rare compound bow that isn’t center shot. Crossbows will do great with heavier broadheads on stiff arrows. The draw weight of the bow does have some bearing but not as much as how true to center the arrow flies off the rest. The more blades a broadhead has OR the larger the cutting diameter, the thinner and more fragile those blades will be. More blades or larger blades mean more cutting power and a larger wound overall. It’s a tradeoff but for larger animals, I will take the cost of a broadhead for a better hit. The one downfall of larger blades is that they can get hung up in the ribs, especially with smaller animals. Usually, the blade will just bend and most of the broadhead will still do its job. Sometimes the arrow will do little more than break the surface of the animals hide but those hits tend to be rare. Don’t think that smaller blades are less damaging than larger blades. ANY of the broadheads on this list can deliver a lethal wound to any animal, some are just more efficient. Save the big blades for deer, for elk, bear or hog go with penetration. Weight of a broadhead has little to do with penetration or the size of the animal and more to do with accuracy. Choose your weight around your bow and arrows. For more information on this consult your local hunting shop or see the link in ‘Additional Information’ below. More dangerous animals like bear and wild hog need a deep penetrating broadhead with a large cutting diameter to bring them down quickly. Hogs especially are likely to go wild once hit and can be a threat. Of course, if you hunt from a tree stand you won’t have a problem. It's us ground hunters that need to worry. For larger game like elk or mule deer, opt for a broadhead with a chisel or other strong tip profile. Thicker bones will destroy a lot of cut-on-contact broadheads and can even stop the arrow in its tracks. Cutting diameter is important but it is not the be-all-end-all factor in an arrows lethality. Arrows that penetrate deeper have a better chance of taking down an animal quickly. The best bet is always something that leaves a large, open wound that the flesh has trouble closing over. All the broadheads here will do just that. Small game in terms of broadheads would probably be fox, coyote, and large rabbits. The smallest game like squirrel require special broadheads to hunt effectively. Unless you want to irreparable destroy a tip and probably an arrow, save the big broadheads of the big critters. With smaller animals, it is more likely that you will over penetrate and hit a hard surface after the arrow pierces the animal. Opt for a sturdier broadhead if you want to ensure it has a long, useful life. The same is true for Turkey. Smaller game will call for a smaller broadhead if you are hunting for food. No need to take chunks out of a rabbit that has very little meat on it anyway. Even the best broadheads for whitetails don’t need to have a 2” cutting diameter. Always check your local laws before purchasing broadheads for hunting to make sure they comply with state regulations. Sometimes a broadhead will need a certain weight or cutting diameter to meet with local laws. A list of every states broadhead laws can be found here. For a more in-depth guide into selecting the best broadhead for you, see our guide here. When it comes to the king of the pack, the G5 Montec is hard to beat! This is one of the few go-to broadheads for elk hunting and for good reason. Though it isn’t the normal chisel tip people prefer for large boned game, the solid one-piece construction and thicker blade profile can handle hard bone impacts. The Montec may be the most accurate fixed blade broadhead on the market today. It’s superbly crafted and well balanced. Simply put, G5 has produced one of the top fixed blade broadheads available without question. There is no doubt that this is a lethal, razor sharp broadhead and a thing of cold beauty as well. 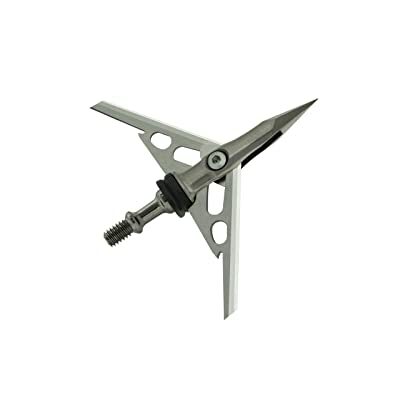 This broadhead is a three-blade solid design with a cut-on-contact point for deep penetration. They are sold in 85gr, 100gr, and 125gr options which would cover most any bow shooters needs. The 85gr are by far my preferred broadheads for traditional and recurve bows. The cutting diameter is a respectable 1 ⅛” which is a little smaller than a lot of today's broadheads but you can expect plenty of damage out of that smaller size. No matter what game you are after, this is a solid choice and would excel in taking turkey and any mammal from whitetail on up. This is one of my personal favorite broadheads for hog. If you opt for a lightweight bow, the 85gr model is also a great small game broadhead. There are high-speed variants which are some of the best crossbow broadheads for deer and other game that money can buy. For our top-rated mechanical broadhead, the Rage Chisel is a shoo-in. More people are opting to use a Rage broadhead for deer hunting than any other brand on the market. With a chisel tip to blow past any bone impacts and a large cutting diameter, this is a great choice for medium sized game. The Rage Chisel is also known as a broadhead that is easy to tune to your bow. It’s well-crafted and durable despite its thinner blade design. If you are in the market for an expandable broadhead, you won’t go wrong with the Chisel. All Rage broadheads are known for quality and lethality, no matter where you look it’s one of the top-rated broadheads. The Chisel has three blades that deploy by kinetic force behind a wicked chisel point. 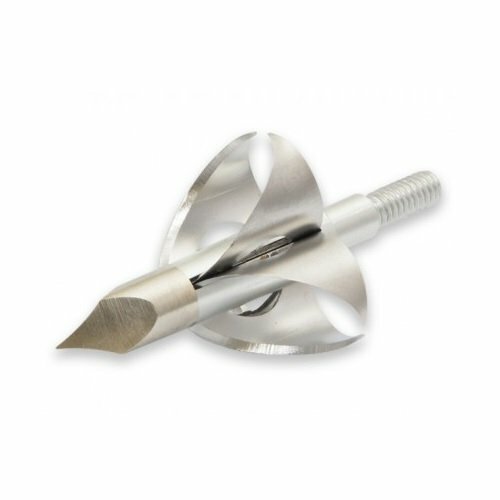 This 100gr broadhead has the mass for plenty of impact out of any recurve or compound bow but aren’t recommended for use out of crossbows. The respectable 1 ½” cutting diameter with the ability to slide past bone make this a good contender for any larger game. For hunting deer, hog, turkey and even smaller game, this is an excellent choice. Elk and bear a certainly possible and many people use this broadhead for large animals. With its large cutting diameter, you are likely to get a wound large and deep enough to take down most any North American game animal. Rage has included a practice head for this broadhead with every pack to save your edge for when it counts. Part mechanical, part fixed-blade, the Muzzy Trocar is a rare gem in the world of bow hunting. Muzzy has been making archery equipment forever and has managed to always provide a great quality product at a reasonable price. The Trocar is no exception with its two small fixed blades and impressively large mechanical blades that are sure to provide a lethal wound. The chisel tip on the Trocar is perhaps the strongest on the market which is a good thing because its non-replaceable. It can handle hard bone impacts well and keep cutting but after a few solid impacts, the broadhead may not function as well as it should. These are a great option for those wanting a broadhead for crossbows. Muzzy makes a variety of broadheads but none like this one. The smaller bleeder blades are fixed while the larger blades are mechanical and will deploy on impact. The chisel tip has a lot of mass and is immensely strong, I have seen these broadheads break deer rib bones and keep going. The weight is an average 100gr but can sometimes be found heavier for crossbow aficionados. The cutting diameter of 1 ⅝” is more than adequate for most any game. This is one of my preferred broadheads for turkey. It does an excellent job and would do the same for other smaller game but could easily take deer without an issue. I would hesitate to take this against elk or bear with its somewhat fragile tip but have used it on hogs successfully. If you use it on larger game, the tip is likely to bend and foul up the mechanical blades, destroying the broadhead. If you check anyone’s broadhead reviews, Rage will always be a contender. They have taken the bowhunting world by storm the last few years and show no sign of stopping. This is the second Rage broadhead we liked mostly because it's one of the most accurate mechanical broadheads we could find. When it comes to a large wound channel, this broadhead wins every time at a whopping 2” of cutting power but with the narrow, hypodermic profiled tip it will dig plenty deep enough to take down most mid-sized animals. The only thing that knocked it out of a higher spot is its lower durability than some expandable broadheads. For a broadhead only weighing 100gr, this thing is a little terrifying. It’s a slicer as much as it’s a piercer. It may only have the two blades but they are HUGE blades. Like most mechanical broadheads these deploy by the force of the impact. The tip is needle-like and slides past bones. Where this broadhead slices, the wounds left behind are truly amazing! When it comes to broadheads for deer, this is one of the best and would do a fine job with turkey and smaller hog. Maybe steer clear of using it on larger game with the somewhat weaker blade profile but some people have certainly done it. 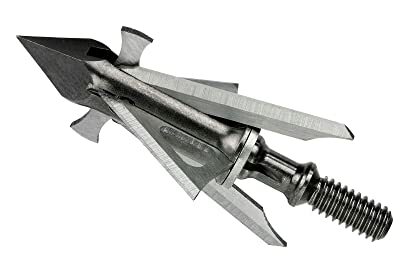 Like the Chisel, this broadhead comes with a practice head. Flying Arrow Archery is doing some novel work in the broadhead market and by novel, I really mean terrifying. Though the broadhead may not actually be toxic, I can’t think of a better name for it. When I started hunting with the old fixed broadheads I could never have imagined something like this monster! Starting with the cons this time, the tip is very pointed and prone to bending if it hits something hard. Practicing too much with this broadhead is a sure way to ruin it. However, this thing will take out a chunk of flesh that may only be an inch, it's an inch that will stay open. The Toxic is a hands down killer! This was a broadhead that had to be tested. The testimonials weren’t good enough. The first thing is this little 100gr, 1” demon of a head is like a laser! Easily among the most accurate on the market today out of both my recurve and compound bows. This is a no-go for crossbow people. The hole it leaves is small but it’s a hole that doesn’t close up. This is a scary broadhead for sure! It makes a great broadhead for turkey and would work fine with rabbit and small game. I would hesitate to take it larger than a moderately sized deer but a number of people have had good success with trophy-sized bucks. 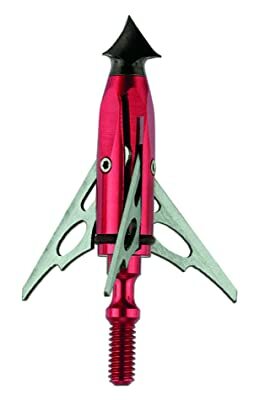 It almost appears that this broadhead would be difficult to shoot but that isn’t the case. The accuracy truly is shocking! There are literally hundreds of different broadheads on the market. Most of them are clones of classic designs that have done well for decades but some are whole new styles. It's an exciting time to be in the world of bow hunting with so much innovation in every part of the hobby. I await each spring to see what new offerings will come up in bows, arrows, and broadheads and clutch at my wallet as my bank account drains away. The big players always have something up their sleeve and next year will bring more choices to the hundreds lining the shelves of our favorite sporting goods store. With so many options out there, the only wrong choice is not making a choice. Deer season is quickly approaching and the time for all the pre-season work is here. If you plan on hitting the early season when the deer are still more sedentary, it's time to get a start! You have a bow to tune and broadheads to practice with. The time to scout your location is right around the corner. Months will fly by leading up to hunting season and you want to be ready on day one. No sense on missing out just because you were indecisive! Just a few months after the start of deer season, turkey time will be upon us, not to mention the early season for elk and bear. Some states will have big horned sheep season around October and wild hog in my area go nuts around late September. It's going to be an amazing fall! There are broadheads aplenty to take whatever your preferred game. I know there is a sense of urgency and picking a broadhead is never an easy choice with so many options in a crowded market. Hunting is big business these days. Any of the above choices are among the top-rated broadheads anywhere and will serve you well but you will have to choose what fits your needs and budget. Just don’t wait too long, he who hunts earliest gets the big buck! No sense having the absolute best broadhead if it’s still at home.